I need to figure out if it converges or diverges and then the value if it converges. I have been trying to figure out a formula for the denominator of the exponent so it matches the respected root in each term, but I can't figure it out. Is there another way to do this without trying to find a formula for the nth term? It seems pretty clear the sequence converges to 1. It's like repeatedly punching the square root button on your calculator. 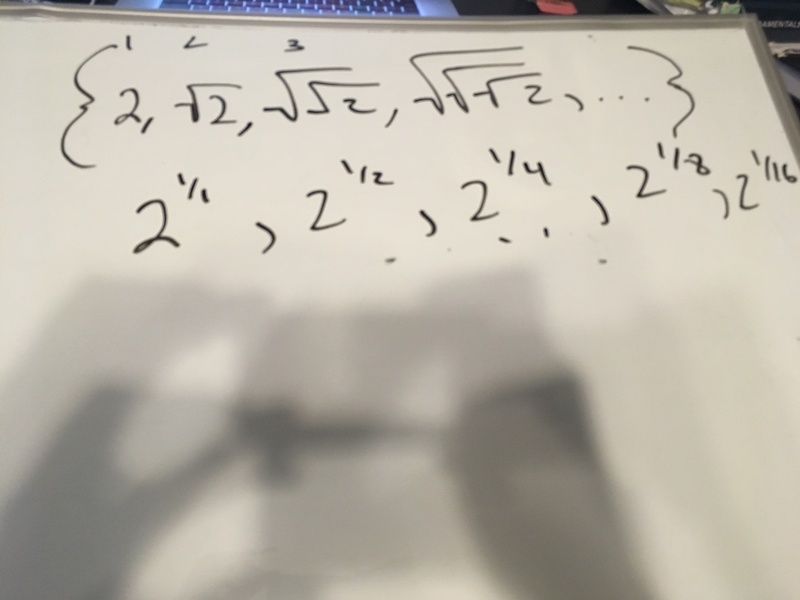 What is the 16-th root of 2? It's 1.000-something. It has to be bigger than 1 but not much bigger. Look at the logarithm (base 2) of each element if Maschke's statement is either not obvious enough or not rigorous enough. Hmm... Help me here. How do I relate log base 2 to roots here? I am missing the relationship here. Thanks for your response. Do that to each term. Does this give you any ideas? Taking the limit as n approaches infinity equals 1.